Anyway, I could make my whole first entry on my blog centered around this disbelief that obviously hasn’t worn off; but then I should title it “Things that I don’t understand” and even the internet would just not be ready for what would go in that blog quite yet. So instead I will say that in retrospect; I am grateful for that conversation. I am grateful because it taught me something about music. It taught me about this individual. And most importantly, it taught me about myself… as everything in this life does because I’m a therapist… blame it on the day job J So… Step into my office, make yourself at home haha. Sidenote: The other day I had a conversation with my dad about moviesthat went like this Dad: “Christie have you seen Seven Psychopaths” Me: “Dad, do you know what I do for a living?” LOL. Anyway, I digress, back to the topic. You see, I thought about this conversation with the individual who did not like music for quite some time after I was a part of it and in reflecting on it, I had some sort of a revelation. To the person who does not particularly “like” music: it seems, and I say this in the most nonjudgmental way possible in accordance with proper therapist form, that “not like music” must require that this individual had not tapped into a part of his/her own soul. A part which connects you to something bigger than yourself. The part which recognizes beauty although it cannot be understood and sees their own integrated life mirrored in the way a melody intertwines with a word to penetrate the soul. Music dances the fine line of silence and speaking, as Victor Hugo famously said: “Music expresses that which cannot be said and on which is impossible to be silent.” Music lives within the space between. We have all been in that space before. Where our actions speak for us, words we cannot say. Where our tears or our crying releases the emotions held on so tightly for so long. Where a smile or a gaze is all one needs to communicate. 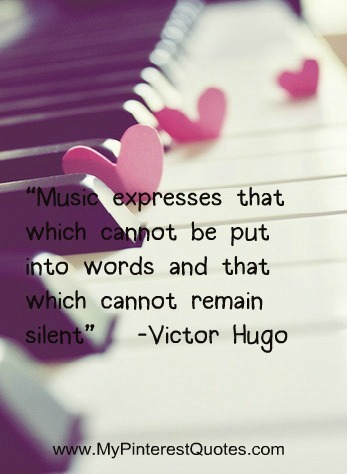 That is what music is. It speaks words better left unspoken. It gives a voice to the deep things of the heart. It transcends the physical world and cannot be contained by notes on a page or words in a notebook. Music is a gift from God. And if you find you have never allowed yourself to open that gift and discover parts of yourself in a melody, I invite you to join me on this journey. I would like to formally invite you to my lyric therapy blog. I would like to invite you to open your eyes and ears and listen to what lyrics say to you. To sit in the presence of someone’s emotions, thoughts and beliefs and in them recognize another layer of yourself. In combining my love of therapy and music for years on my own radio show, one of the things I have discovered through integrating my passions are that there are more similarities between the two than there are differences. Both music and therapy invite you into a safe “space between”. They both reveal another layer of yourself and force you to grapple with parts of yourself and your emotions you may not want to face or never even knew existed. As I say to all of my psychotherapy patients/clients who fear I cannot understand them because I have “never been divorced”, or “never been diagnosed with depression”; you do not have to have had experienced the same little p “pain” as the next person to be able to relate to big p, “Pain”, that is universal to every person on this earth. Just because I have never had an eating disorder, does not mean that I cannot relate with the common human suffering that we all experience from feeling lonely, inadequate or not worthy of acceptance and love. And the same beautiful truth lies in music. As you listen to lyrics, you may not have thought those thoughts. You may not have lived that life. But the beauty of music is this: it is universal. You do not have to be brave to find courage in a song. You do not have to be black, white, orange, yellow, or purple to be moved by a “major chord and a minor lift”. You do not have to speak English, German, Spanish, Farsi or Swahili to feel the utter despair of a broken heart. You do not have to be Carlos Santana to feel with the subtle inflections of the Spanish guitar. You do not have to have lived the same life as Bob Dylan to be intrigued by mystery and metaphor in song. And in fact even if you WERE Beethoven, you would not be able to lose yourself in his incomparable symphonies because he was blind and deaf, only able to imagine what the flawless combination of notes he put on a page would actually sound like in the physical realm.